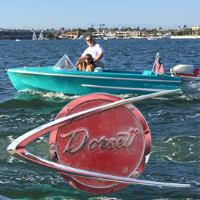 You are here: Home Forum Home Other Outboards? '60 Flying Scott 60HP experts? '60 Flying Scott 60HP experts? TOPIC:	'60 Flying Scott 60HP experts? I'm getting closer to test firing my Flying Scott. It looks to be 100% original at this point. I am certain I will need advice as I go through it. I've read through the 60 Dorsett posts as well as the blog and I've searched several sources for information so far. Who are the best members for me to reach out to regarding Flying Scott's? I see Ponyboy hasn't been on in three months so not sure if he's still active. Anyway......The lower unit bolts were not all there and there was about 1/4 gap between lower and mid unit housing when I got the boat. It appears somebody removed the lower unit at some point and probably couldn't or didn't know how to align the shift rod or the driveshaft and couldn't get it to seat back up. 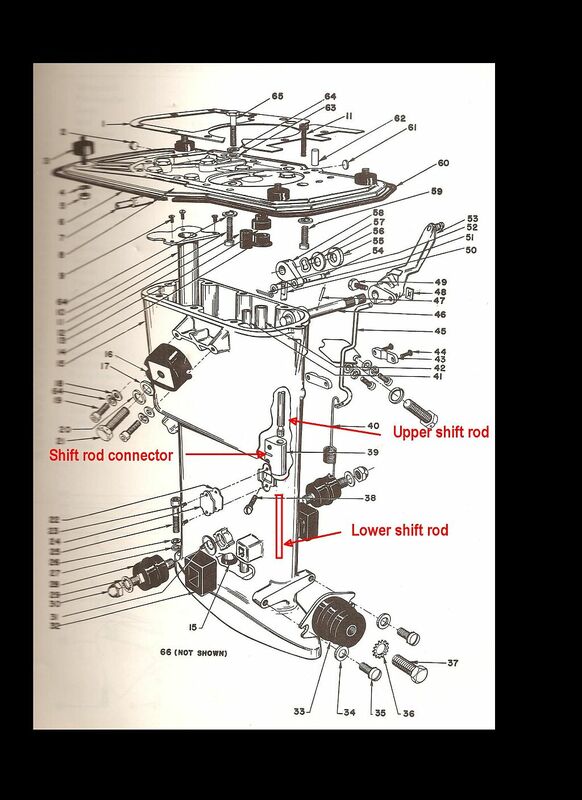 From the Scott manual pages I have and the diagrams there, it "appears" that there is a grommet about 6" from the top of the shaft that is missing and I can't tell if the "retaining ring" at the top should be attached to the shaft or if it's up inside the middle or upper unit. I'm also wondering if the lower unit to middle unit should have a general gasket between them as I don't see any residue or sign that there was one there. The 1960 60 HP can have two different shifter systems. The early ones have a window on the leg held on by two screws. 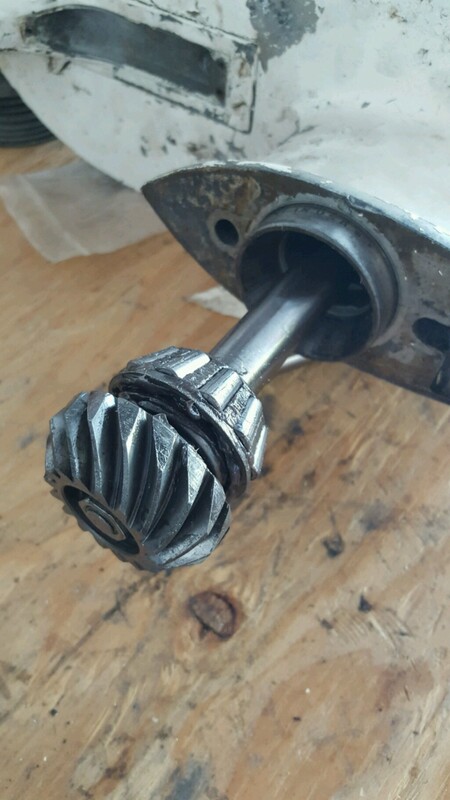 It has to be removed to connect the upper and lower shift rods. 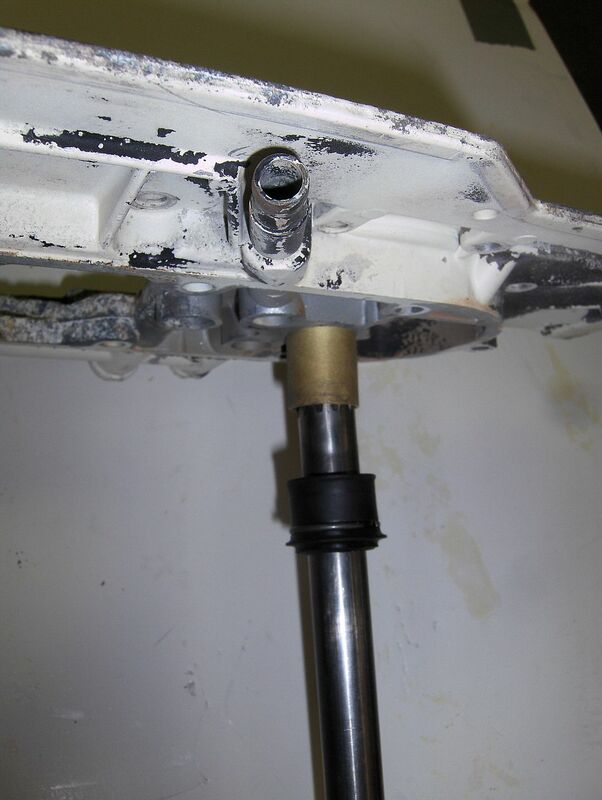 The late model uses different shift rods and are disconnected after you have dropped the lower unit a ways. Which one do you have? Both systems are covered in the 1960 blue cover Scott Service manual. I believe the grommet you are talking about is the grease shield on the drive shaft. 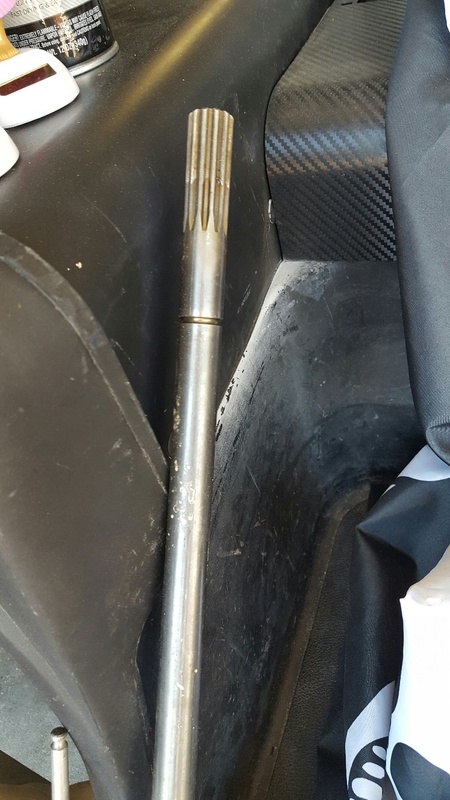 It has a retaining ring that slips into a machined groove in the top of the drive shaft and the shield goes over a brass tube that sticks down from powerhead when you index the driveshaft into the crankshaft spline. That's not normally a problem, the gap is probably caused by something wrong in the shift linkage assembly, or one of the water tubes didn't go into place correctly. There is no gasket between the lower unit and the leg. Is it a long shaft? I believe the long shaft model has an extra connector shift rod and that can cause problems. Thanks for the reply and information. I was able to find the blue cover manual as a pdf file and printed it out yesterday. I have an older style double bend shift rod and it's a short shaft. I'll have to play with grommets for the top of the shaft to find something that fits. 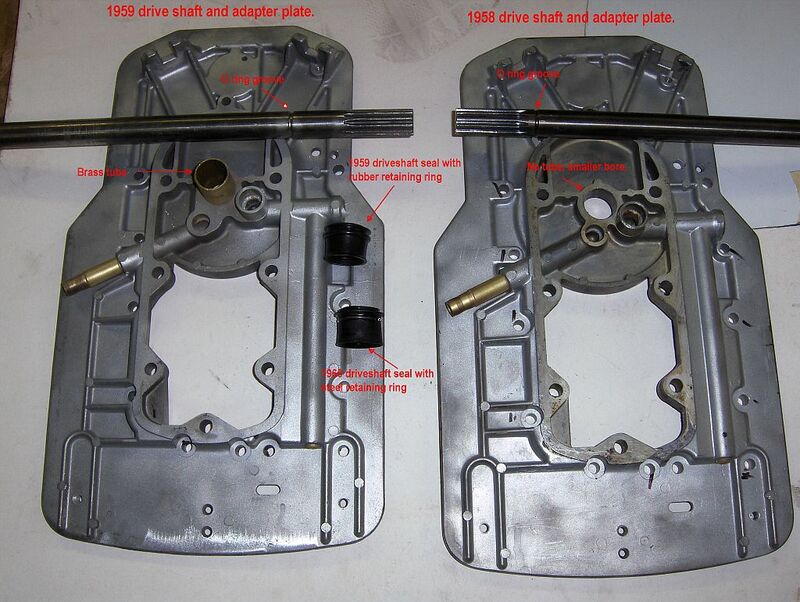 I've been looking at the parts list from the 60 Dorsett blog for replacement parts as well. I can't for the life of me find the impeller part numbers he referenced from Sierra that fit so a call to Sierra is probably in order to see if they can point me to where to purchase the Cooling and bailer impellers that fit. for the top of the shaft. Are you talking about the shift shaft or the drive shaft? 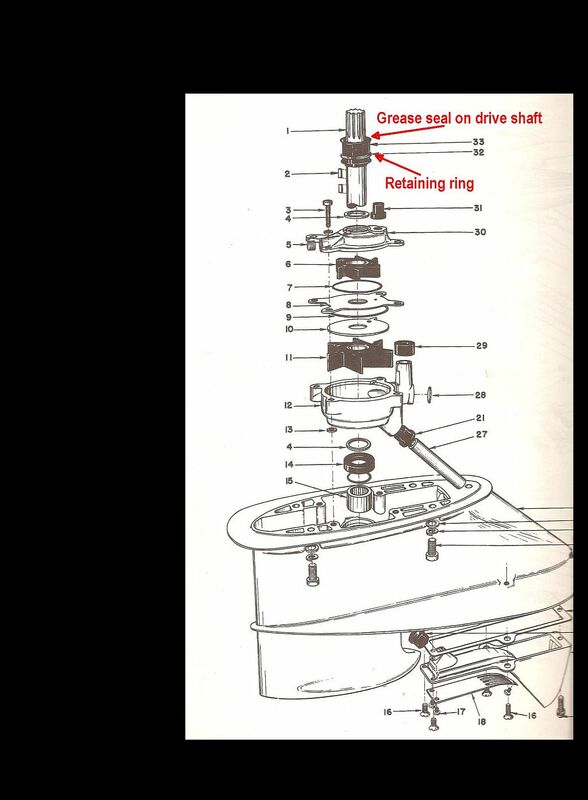 I've attached a page from the 1959 60 HP parts book (same as the 1960 model) showing the grommet and ring on the top of the drive shaft. I've never had that part cause a problem installing the lower unit. There is no grommet that I am aware of on the top of the shift shaft. 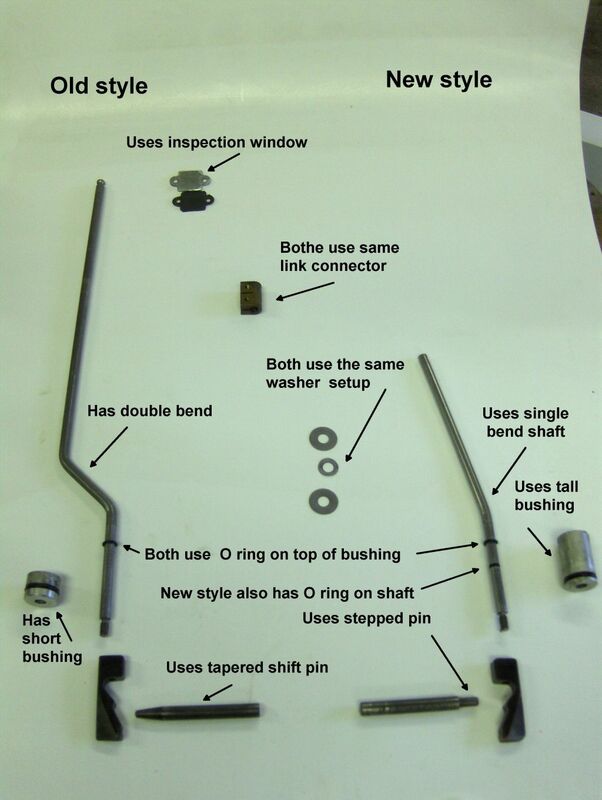 I attached a pic showing the shift assembly pointing out the upper shift rod, the connector, and I sketched in the lower shift rod. There is no grommet on the upper end. There should be a 90 degree bend on upper end that indexes into number 58 and held in with a cotter pin. scottatwaterimpellers.com/ or once and while an NOS impeller turns up on ebay. From the sound of your last post you must have dropped the lower unit completely? Hi welcome to the Scott world I have a few tips for you. The grommet on top of the driveshaft is to help keep out engine nastiness around the shaft, if yours is destroyed it's not the end of the world just keep searching for a new one. I had an impeller made from the guy in the link above, you have to submit a old bushing though, and honestly my fins broke off in no time, pretty much a chappy job... doesn't matter though cause his website says he isn't doing it anymore. You just have to search eBay for one. So the short run McCullough 1959 to 1967 have one motor and can get my hands on the same one you have. parts are very hard to find is a understatement. Sorry for any confusion. I meant the drive shaft. Since the lower unit wasn't attache completely (only two screws of the wrong type holding it on I assume somebody removed it in the past. The grease seal and clip are completely gone from the shaft, not damaged or destroyed, simply not there. 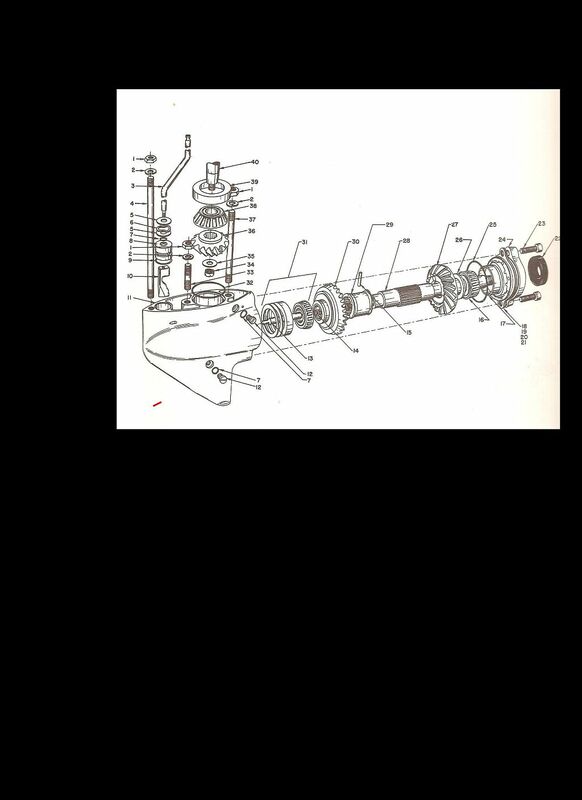 I'm attaching a picture but based on the part diagram you attached, I just need to find it somewhere. Well, yes, to say the very least!! Lol. I have been looking at this blog and trying to find a source for the parts list he created. I just can't fine the two impeller part numbers available so I'll have to call the manufacturer and see if they have an alternate part number or something. Give this link a try. I went as far as getting one into my "cart", but didn't go any further. Not going to repair it if someone else needs it sell it. I got the impellers handled. Looking for the drive shaft top grease seal and retaining ring. Any suggestions? So, I have a question, does that C-ring just clip around the O.D. of the rubber seal, or does the seal have a groove molded into it? The reason I ask is, Merc uses a bellows-type rubber seal on some of their older 3-cyl and 44-c.i. Inline Fours and maybe you could adapt one of those to this application. P/N 78654A 1. Note that the way the Merc seal assy works is the splined plastic piece slides over the diveshaft splines and stops at the bottom of the splines. Then the rubber seal, which also has splines at one end, slides down over the top of the plastic. A bit different way of retaining the rubber seal, but I suppose a spring clip in the groove would be effective as well. 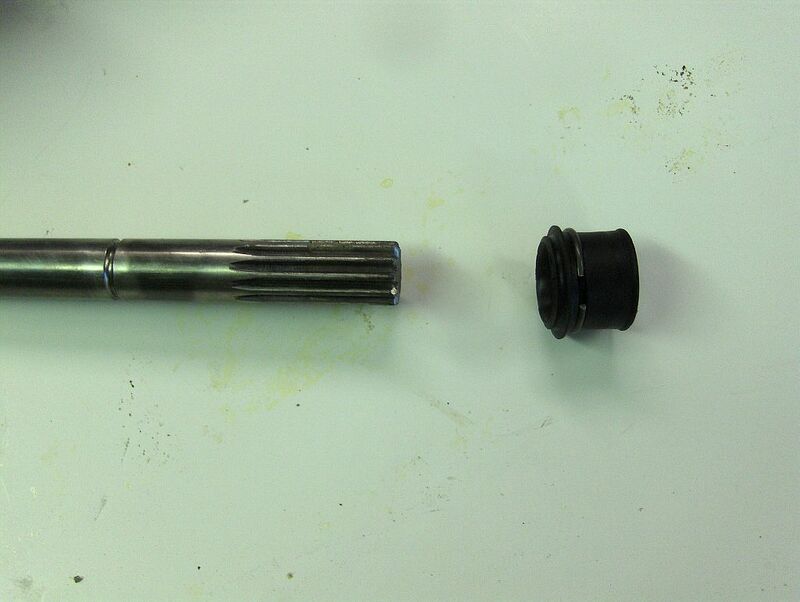 IIRC the Merc driveshaft is 3/4" in diameter, don't know what the Flying Scott is. If it doesn't fit, maybe it'll inspire you to make something that'll do the job. All it really needs to do is stay in place with the spring clip, and flex enough to squish against the bottom of the crankshaft for a good seal. Even a piece of rubber hose might work, but of course you'd need to use material that's up to the task. BTW that kind of spring clip should be a commonly available item, it'd have to be stainless but a "specialty" house might carry something you can use. One last thought, if you're making your own seal, instead of the clip wrapping around the seal, just install the clip in the groove; back it up with a flat washer that fits the shaft snugly, then the seal would bottom against the washer. Seems to me any type of flexible, suitable seal could be used then. See pic below for the Merc item. my challenge is when I receive the boat, the seal was completely gone. I don't have the original piece to reference. I've been going off the part manual drawings and pictures I can find on-line. I'm hoping it's something that cross references to something with the same shaft diameter. 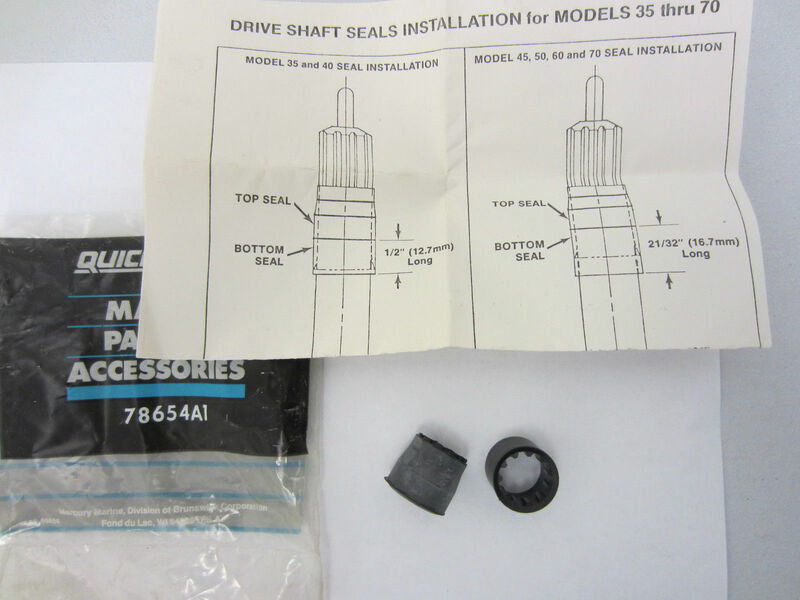 It appears from the part manual and pictures I've found that it's a rubber seal that is 1-2" long with a retaining clip that wraps around the seal and somehow presses/fits into the groove in the shaft. I originally thought the clip went below the seal but it appears the seal is about 3/4 above the retaining clip/groove and 1/4 below the clip/groove if that makes sense. so, I'm now thinking the seal somehow is molded to match the groove an the retaining clip holds it in place. This picture says it's a lower seal but I believe this is very similar or the same shape as the upper seal that's missing. Here are pics of the seal you are looking for. The first shows the seal and how it indexes with the groove in the shaft using a wire clip. The seal stays stationary and the shaft rotates so this fit is fairly loose. The second shows the seal and shaft lined up to be pushed on to the brass tube that is pressed into the power head adapter. The tube and seal are a slip fit and the seal does not rotate. I have never found a supply for the seals. They were a Scott only item. I don't think it would be too hard to find something with an ID that would go over the tube and then be adapted to index with the shaft. I have taken apart many Scotts with the seal literally disintegrated without seeing any problems caused by it. Actually the 58 60 HP, the first ones built, didn't have the brass tube but just a groove much higher on the shaft, and an O ring that went up into the powerhead plate. The change may have been made to make it easier to install the shaft, but it could have been poor sealing. I attached a pic of the 58. 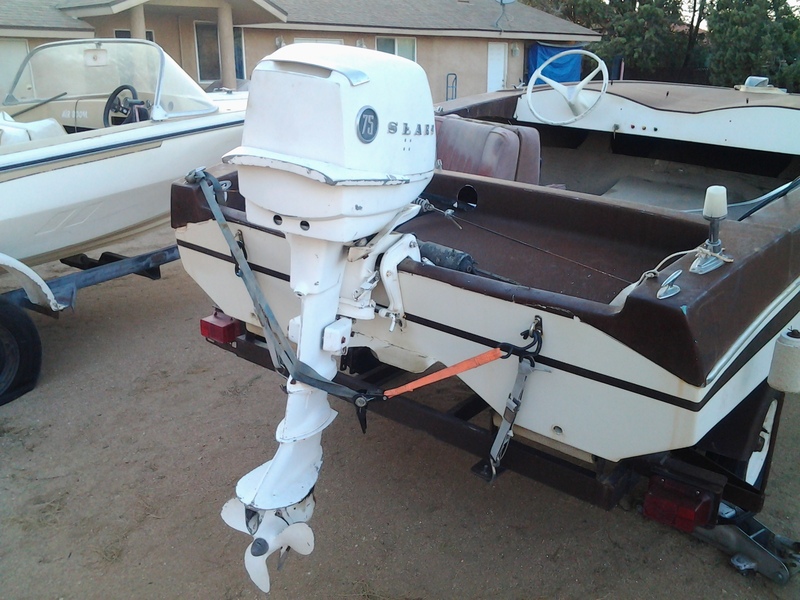 It may give you some ideas how to setup your 60HP. It would be better if you started a new post in Other Motors. Sometimes that helps in searches done later in time. You should cover the following in your new post. Year and horsepower, or serial number if it's still readable. What do you think is wrong with the lower unit? Also, if possible, pics of the entire motor and of the power head with the hood off. I know this is and old thread but for future readers, the Large impeller is a Sierra 18-3025. and F.F. great photos and part layouts. wow!